I wanted to write and think you so much for doing such a wonderful job at our wedding at Walton Hall in December. It was a lovely surprise to meet you, and you became such a big art of our day in the most wonderful and unexpected way! All of our guests have commented on how fabulous you were, and asked where we found you! I hope you had a great Christmas and New Year. Thank you again for making our wedding day so very special. I just wanted to give you a very big thank you for making our wedding reception so special. 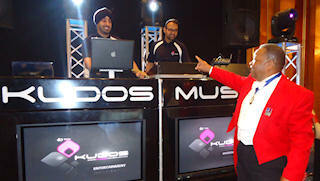 It was a wonderful evening at the Grosvenor Hotel last Saturday night and I can definitely say that you were superb. Many of our guests have commented on how fantastic you were. Your words, prayers and presence were lovely. I hope that we meet again. Just a short note to thank you for a great job you did for us on Saturday. We all thoroughly enjoyed the occasion and many of our friends and guests have remarked how much they enjoyed your friendly and very professional Toastmaster style. We do hope we will have the opportunity of asking you to another function in the future. Once again very many thanks once again. ‘J’ and I wish to thank you so very much for your services as Toastmaster at our wedding celebrations at the Falcon Hotel on Saturday. As you said ‘leave everything to me and enjoy the day’ and this we did. So many guests have paid compliments to your service and very friendly approach. We had a wonderful day with many pleasant memories. Your contribution made the day perfect. We would just like to say a ‘huge’ Thank you for being the Toast Master at our wedding at The Dormy House Hotel. Everybody commented on how fantastic you were. We did not have to worry about anything on the day as we knew that you would take care of it! The wedding went perfect and you played a big part in making it run so smoothly. The photo that our photographer took of the 3 of us should be on its way to you if you haven’t had it already. Let me know if you don’t receive it as I can send you a copy somehow! I am very pleased that my mum found you at the wedding fayre at Stratford Manor, and that she liked you so much, as I would never have even thought of having a toast master! We are very grateful for everything that you did for us before and during the wedding as you helped make the day so perfect. We will definitely recommend you to anybody getting married in the future! Once again, Many Thanks. 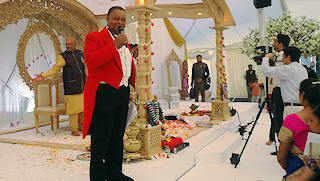 Thank you very much for being such a wonderful Toastmaster for I and M’s wedding, both beforehand and on the day. Your advice and expertise were most helpful and you kept us on track and in the right place at the right time throughout. Our guests certainly enjoyed your presence and your input to the proceedings. Thank you so much for your hard work and support on our wedding day. We had a truly wonderful day. We appreciated your assistance with organising the sequence of events through the course of the evening and the way you welcomed all our guests. Your presence during the speeches and your kind words were so thoughtful and amusing. You really helped to make the day very special for us. 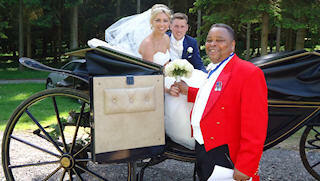 Just a note to say a huge thank you, for making our daughter’s wedding such a special and memorable occasion. It was lovely, as I walked down to the Orangery, to find you waiting, with everything under control, even though we were terribly late. Thank you also, for escorting me into the Orangery, as I was dreading walking in alone. We have had so many people comment on how fantastic you were – you even bought a tear to the eye of one of my dear friends, during the reading at the end. It was wonderful to meet you at last, and I hope we have the pleasure of meeting again. Once again, thank you for helping to make our day, extra special. Just a short note to say a big thank you for helping to make C and J’s wedding so very special. It was a perfect day in every respect but made that little bit more so by the way you kept things running so smoothly. I must admit when I knew you were going to be there I was a little bit apprehensive, in that I thought it was be too formal, but I couldn’t have been more wrong. Once again thank you and I hope to see you again in the future when you venture up to Halifax. Thank you very much for attending S and M’s wedding on Saturday. We all had a lovely day and it was so helpful to leave everything in your very capable hands. People knew exactly what they had to do, and where to go and when, with you at the helm to steer. We had many compliments during the course of the day for choosing such a great guy, and I’m sure you received many yourself. One friend in particular wanted to wrap you up and take you home. So, once again Reuben many thanks and we hope to see you again and we will certainly recommend you to others. Take care, all our best wishes. The relaxed and friendly tone for the evening was set and maintained throughout by master of ceremonies Reuben Lynch resplendent in his traditional Toastmaster’s red tailcoat. He managed to invest the proceedings with a sense of occasion as well as fun, without the pomposity of some members of that fraternity, and kept things moving on apace all evening. On behalf of my wife and I, we would like to thank you for all of your help and support, prior to, and on the day of D and W’s wedding. Having you there to organise everything on the day took such a load from our shoulders, it allowed us to enjoy the day even more. On a more personal note I would like to thank you for all your help prior to my speech, your words of advice, and your build up gave me the confidence to say everything I wanted to in a reasonably professional manner. Pound for pound spent your fee gave us by far the best value of the day. Thank you again, and may we wish you continued success in the future. ‘A’ and I would like to thank you for a most enjoyable evening at our daughters and new son in laws wedding. Your professional and friendly approach was much talked about with many comments still arriving by post! You really did us all proud and we have many memories that we will have for the rest of our lives. Thank you once again and I look forward to meeting you again in the near future. On behalf of ‘S’ and I we would like to thank you for the very professional, relaxed and courteous way you presented yourself as Toastmaster at K and D’s wedding. There is no doubt about it you are a charmer, as most of the lady guests at the wedding will testify. Everyone loved your easy relaxed and happy style and the way you mingled and chatted to the guests during the day. It is true to say that your presence was a tremendous help to ‘S’ and I both during the day and the evening, and you did take away all the worry and anxiety that normally the parents of the bride have to endure. K and D have also asked me to express their thanks for helping to make the day such a memorable occasion. Again many thanks for your advice before and up to the wedding day, and of course your visit to the Welcombe to iron a few glitchesout prior to the event. Please feel free to drop in at [our home] any time you might be passing for a cuppa or something stronger, you are always very welcome and we would love to see you.